An open mind is all very well in its way, but it ought not to be so open that there is no keeping anything in or out of it. It should be capable of shutting its doors sometimes, or it may be found a little draughty. Our double glazed windows and doors will help keep you warmer in winter and cooler in summer, reducing heating costs and air-conditioning costs. We utilise the best of German engineering and most innovative of new developments in science to create an ingenious solution to helping alleviate the effects of climate change! Global warming will not reach you in your well insulated home if you have our double glazed windows and doors installed! The power of the sun in architecture and building and construction is generally underestimated. In one home, we measured 7kW of solar energy per hour on a sunny January day in Sydney, which is enough to run some of your home appliances including air conditioners and heaters. This means that the same amount of energy is heating your home while you are using on an appliance to cool it! But there is no need to feel helpless, because by using high quality building materials such as upvc double glazed windows and doors, that can withstand harsh effects of UV rays and will improve insulation value of your home. Up to 40% of heat or cold, depending on the season, can be escaping your home through badly insulated windows. Would you buy an appliance if you were told it could only operate at 60% capacity? And yet if your windows and doors have an inadequate u value score, you could be undermining your efforts to cool/ heat your home. U-value measures how well a product prevents heat from escaping. The lower the U-value, the greater a window's resistance to heat flow and the better its insulating value. One of the main areas of concern for ordinary single glazed aluminium and wooden windows is the insufficient sealing leading to draughts. If the window is not air-tight when closed, even if it is thermally enhanced such as wood, or even double glazed, the air transfer into the home from outside will negate any benefit of a thermally enhanced frame or glass combination. Attempting to heat or cool a home with poorly performing windows that don't close tightly or have gaps will only result in you wasting money heating and cooling the whole suburb. There can not be any climate control inside your home if your windows are draughty. It is critical to have an excellent weather seal, especially in coastal or mountainous areas where the wind can become a destructive force. Also if it is not air-tight, it will not be water tight either; and in case of a storm where there is exposure to both wind and water, a poorly sealed window will be both draughty and leak water! 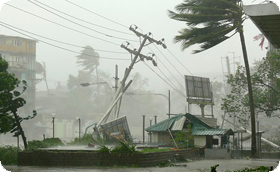 Some areas of Australia are required to have impact resistant windows for protection against cyclones. Why not get the same performance double glazed windows and doors in your home and offer your family a new level of protection and security? Essentially cyclone-proof windows consist of safety glass (toughened and laminated) in a heavy duty frame, their design and construction seek to minimize the impact of wind and debris associated with a cyclone to you home. A broken window provides an entry for cyclone wind, entering the dwelling, increases pressure, and damages everything in its path as it tries to find a way out. 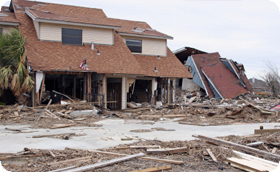 Such a difference in air pressures can cause a building to lose a roof or a even a wall. To protect against damage it is necessary to deflect wind (and anything it carries) and direct it around the building. Don't make the windows and doors in your home a weak point in the architecture or construction - consider upvc double glazed windows and doors for structurally strong and wind resistant windows that will serve you equally well in an emergency. Double Glazed Upvc Windows and Doors are a reasonably priced alternative to cyclone shutters, so consider it an investment in your family's safety and comfort, resale value of your home as well as the environment.